Sheffield Spartans were once again left kicking their heels in frustration after last minute goals denied them what would have been a deserved victory against Whitley Warriors on Saturday. In what was an end to end first period neither team could break the deadlock with both teams creating good chances but arguably the better ones fell to Spartans who will feel they should have done better with a couple of them at least, which would have seen them in front. However it was 0-0 with all to play for in the second. Spartans had Warriors on the back foot for the opening minutes of the period and will again feel that they should have made more of their pressure and chances but Whitley soaked up the pressure to then counter and enjoy a good spell of possession in which they gained the upper hand and were unfortunate not to take the lead themselves. Spartans hit back when a nice play out of defence saw Ross Jordan find Ollie Barron who took his chance well to put Spartans in front on 29.25. Spartans were on top of their game and extended their lead when Stuart Brittle scored on 33.06 from Ollie Barron & Elliott Knell. 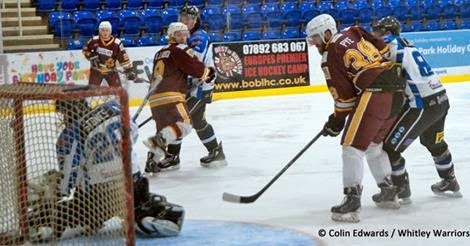 They didn’t have things their own way though as Whitley were fighting hard to get back into the game and it took some sound netminding from Brandon Stones to ensure Spartans went into the period break with their two goal lead intact but deservedly so. Spartans had been the better team to this point but the final period was initially more evenly balanced with chances for both teams but it was Warriors who gave themselves a leg up back into the game when Scott Cooper fired home a powerplay goal, the result of a dubious decision against Nick Whyatt for holding, which was timed 44.10 with assists to DJ Good & Callum Watson. Spartans responded well to the goal and Whitley were grateful to Richard Lawson in their goal for some fine saves to keep them in the game but he couldn’t do anything about Stevie Weeks goal timed 51.11; a powerplay goal with a cracker of a shot from the blue line that took a slight deflection past Lawson with assists to Scott Morris & Dougie Jordan. It was with some relief as Warriors were just starting to gain the upper hand but they weren’t beaten and hit back hard at Spartans, even more so when they pulled their netminder with just under four minutes remaining but Spartans defence were unshakable and were seeing the game out well until Ollie Barron was called for tripping, rather harshly it has to be said on 59.10. Warriors won possession from the face off to score a well worked goal timed 59.23, scored DJ Good, assisted Dean Holland & Simon Leach. Thankfully Spartans won possession as the clock ticked down and with several options available, including maintaining possession the puck was gifted to Whitley who shot the puck on goal and were quicker to react to actually hit the puck into the net when it should have realistically been cleared. Jamie Tinsley was the scorer with assists on the goal to Adam Reynolds & Dean Holland to see Warriors claim what had looked like at one point, an unlikely point, with the final score 3-3. Spartans once again were punished for failing to see the game out, a game they should have won but it is also fair to say that had they taken their chances in that first period it could have been a different story but they didn’t whereas when the chances fell to Whitley, they made them count and deserve credit for the way they continued to battle throughout the game and sensibly defended their empty net for over 3 minutes to hit back and share the spoils in what was another good game of hockey between these two teams.